Going 4 months without duck is a looong time for me. Just ask my sister Deirdre and friend Kathy how often during our road trip in Oregon I mentioned eating duck. It became a running joke. Despite the POURING RAIN on Saturday, I braved the elements for a trip to the Union Square Farmers Market and bought some duck breasts (yeah!). I had rhubarb in the fridge and planned to make a compote for breakfast but the thought of the tart rhubarb and duck sounded really really good. So, I just made this up. Gently remove the fatty skin from the duck breast. Set it aside. Smear the jam on top of the raw duck breast. Put the fat on top (like a sandwich). In a shallow skillet, pour the vinegar and water. Place the duck breast in the liquid. 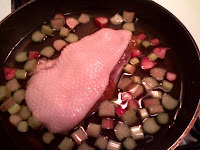 Sprinkle the diced rhubarb around the duck. Simmer on medium-high heat for about 7 minutes. 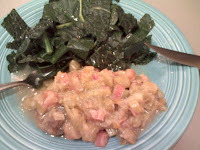 The rhubarb will start to fall apart and the vinegar will stink. As the liquids evaporate, the skin might curl up and fall off the breast. That’s ok. Turn the breast over if this happens. Check the meat for doneness. If the breast is the same firmness as the space between your thumb and forefinger, it’s done. Depending on the thickness of the breast, it may still be deep pink inside. Cook the breast longer if you don’t want to see pink. I served this sweet-sour duck with elephant-leaf kale. A perfect spring-summer dish.